Pretty, isn't it? That's WEEU in Reading, Pennsylvania, as photographed on Sunday afternoon, August 31, 1997. When we pulled up to the site on Broadcasting Road, just northwest of Reading itself, those four towers were running 1000 watts on 850 kHz, just as they'd been doing for decades. Back then, it was a kilowatt daytimer on 830 kHz, moving to 850 inthe great NARBA shuffle of 1941 and eventually adding 1000 watts directional at night from that very rural Broadcasting Road site. WEEU radio, however, thrived, remaining a lively voice of Berks County with a mixture of local news and talk, AC music, sports and more. 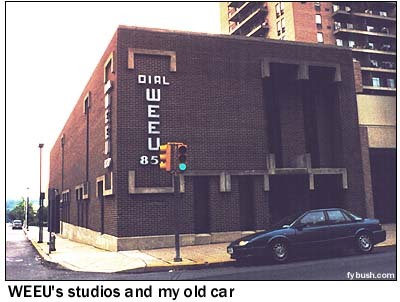 But by the time we drove past its Fourth Street studios on that August afternoon six years ago (look at the then-new NERW Saturn parked in front! ), some big changes were in store, as the "Coming Soon - Broadcasting Square Shopping Center" sign in front of the 850 towers attested. Was WEEU losing its tower site? Would 850 be knocked down to 34 watts at night from a makeshift stick somewhere? Nope - this AM story has the happiest of endings. In the summer of 1999, WEEU left Broadcasting Road, and 850 kHz, for good, moving about 15 miles northwest to Shartlesville, a small community astride I-78 that had heretofore been best known as the home of Roadside America, a tourist attraction that features a huge model train and village layout. Today, if you pull over to the edge of the Roadside America parking lot and gaze across I-78's traffic, you'll see WEEU's new home - six Pirod towers of varying heights (some 300 feet, some 400 feet) operating on 830 kHz, the very spot on the dial where WEEU got its start all those years ago. WEEU started here with 5 kilowatts day, 6 kilowatts at night, but two years ago it powered up again. 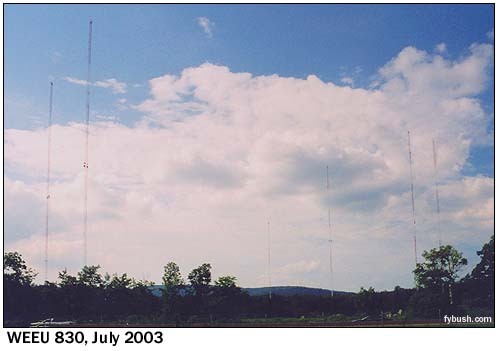 WEEU now runs 20 kilowatts by day from two towers (they use five for the night signal), blanketing much of southeastern Pennsylvania with a signal that continues to epitomize full-service AM radio, full of local news, talk, music, and even a Saturday talk show for teenagers. Refreshing, eh? Tower Site Calendar 2004 is NOW AVAILABLE! Click here for advance ordering information!